Navigate to More page in the Main view (scroll Tab bar on top) and click Recipes. Long-tap Tab bar –> Configure Tabs –> set check next to Recipes or Recipe details. This will allow quick access to recipes by scrolling the Tab bar. 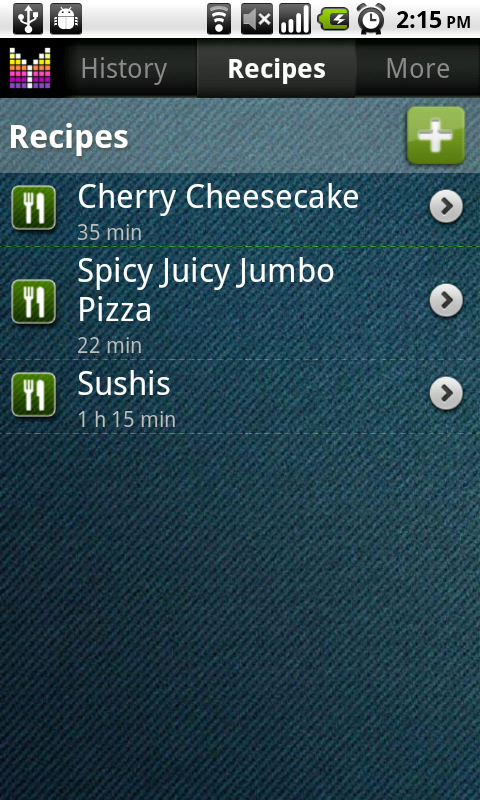 Fling (hold and move right/left) the second button on the Home screen until Recipes show up. Click Recipes. 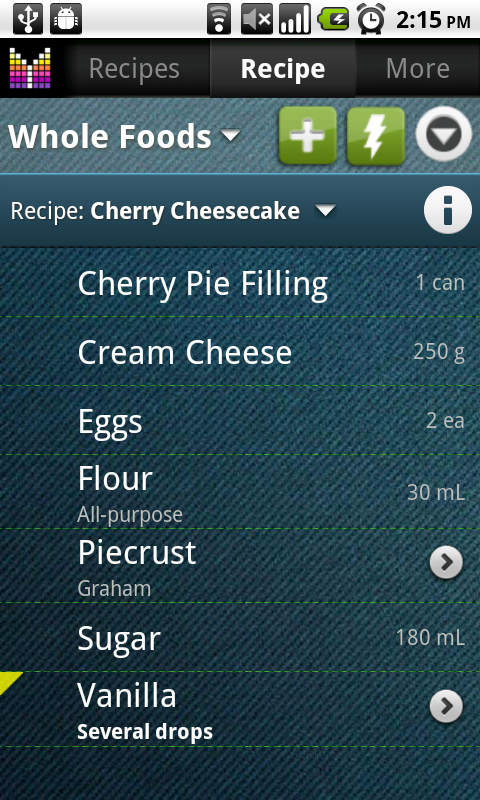 Note: Recipes is a premium feature (available in Full version only), Lite version allows only one recipe to try feature in action. Navigate to Recipes page as described above. Enter Recipe name when prompted. Populate Recipe’s fields Details, Directions, etc. Click (>) button of a recipe. Long-tap the recipe you want to delete. Tap the recipe you would like to work with. Recipe details screen will show up. Now you can add/edit/delete ingredients as you would with any shopping list. Quickly navigate to Recipe attributes by clicking (i) button. 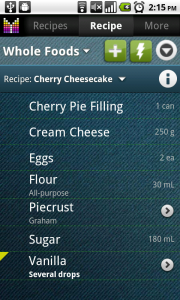 Tap recipe name (Cherry Cheesecake on the pic) to switch to another recipe. Long-tap recipe name to quickly navigate to recipes list. 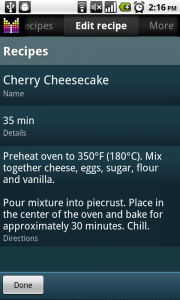 Navigate to Ingredients screen of your recipe as described above. Make sure your shopping list is selected on top of the screen. Tap checkbox next to an item to add to or remove from the shopping list selected on the top of the screen. – OR – Tap item row and choose Copy to to add item to multiple lists. Enter the number of servings you would like to add when Multiply by dialog shows up. Selected ingredients will be added to your shopping list. If any ingredient already existed on the shopping list, item’s quantity will be adjusted accordingly. You can also use Add selection option available in the side menu. When a Recipe contains Ingredients from more than one store (more than one Pick list and, hence, shopping List), and all ingredients are selected for purchase using Select All, ONLY ONE shopping List is generated. This is for the last store selected to add Ingredients to the Recipe. Or for whatever shopping List happens to be active (not sure this is the right word) above the Recipe name on the Ingredients screen when the Select All is done. This single shopping List contains all the items from the Recipe regardless of which store they can be actually be purchased from. Is there a way to create multiple shopping Lists from a single Recipe? As usual, thanks for your excellent support. On re-reading the manual (duh! ), found how multiple shopping Lists can be manually created. Although I feel that this manual process is very tedious particularly when the Recipe contains many Ingredients spread across many stores. And it requires the user to remember the store for each ingredient and to ensure that the correct shopping List is selected prior to selecting the ingredient. This particular user is not always that attentive and coordinated! It would be great if this manual process were automated in some way so multiple shopping Lists for the appropriate stores are magically created. My problem was that I used the Select All on the box that shows up if any ingredient is long-pressed. I don’t see this box described in the manual. What is the design difference between this box and the Add to List box described in the manual? Prakash, thanks for your questions. Unfortunately, there is no way to add ingredients to preset stores. It is only possible to add items to the current shopping list which is selected on the top of the screen. As for difference between “Select all” and “Add all” commands, the first one will make sure that all ingredients exist on your shopping list while the second will increase each item’s quantity if it already exist on your shopping list or will add an item otherwise. Hopefully this makes sense. May I suggest keeping a running count of items and total cost as the Ingredients in a Recipe are added, changed or deleted? This would be for the whole recipe and will provide an idea of the cost of preparing the dish and, maybe, its complexity based on the number of items. This should be before any ingredients are selected for a shopping trip in which case the List will provide this information for a specific trip. I also noticed that when an item is selected from a Pick list for inclusion on a shopping List having nothing to do with a recipe, it is also automatically selected in whatever Recipe(s) it is listed as an Ingredient. I found this to be confusing since, again, the shopping trip had nothing to do with preparing a recipe. This confusion is further increased because any changes made to the item on the List are NOT propagated to the item in its Recipe(s) even though the Sync icon on the top left is ON. This is actually as it should be since, again, no recipe is involved but it does lead to the question of the extent of the propagation: from List to Pick list but not to Recipe Ingredients? Thanks for listening and stay tuned! Prakash, thanks for writing again. Thanks for the suggestion on recipe total. Will consider it in the future. As for check next to recipe ingredients, kindly note that box is checked when there is an item with the same name on the current shopping list. I.e. when you add an item from the Pick list to your shopping list and then switch to recipe, item will be checked because it has been added to the shopping list. As for propagating changes, kindly note that propagating changes such as quantity would mess up a recipe if you decide to buy a different quantity of an ingredient. Thus changes are not propagated to recipe items. Furthermore, button responsible for linking items is not available for recipe items. Are there some recipes that are already loaded or do I enter my own? Hi Donna, thank you for your question. Unfortunately, no, the application allows keeping recipes but there is no recipe catalog yet. Hopefully, we will integrate with existing recipe services in the future to address this. Thanks! I understand that each ingredient is listed as the quantity you would buy at the store, but where do you put the amount you actually use for the recipe? Or, do you just add that to the “Directions” or “Details” areas? Barb, thanks for your question. You may want to consider using Comments field of recipe item for the actual amount used for the recipe. Though Directions or Details field may work as well if it is convenient for you. Is there anyway to have recipes synced? Also, is there anyway to change the format of the recipe when shared by email? Currently it displays the ingredient followed by the comment and then the measurement. I would like to see the measurement then the ingredient followed by a comma then any comments. Also it would be nice to see the directions after the ingredients. I know this seed kinda petty since your Program is so cool allready, but I though I would ask. Also, any chance that you are planing to support Google’s cloud print? Robert, thanks for your feedback and your questions. Unfortunately, recipes cannot be synced now, but we plan to add this capability in the future. As for different formatting of recipe emails and Google cloud print, we may consider these features going forward. Thanks again for your considerations and please let me know if you have any further comments. Hi, is there a place that I can enter an inventory of what I have in hand currently? Hi Heidi, thank you for your question. Unfortunately, there is no way to keep your inventory in Mighty Grocery yet, but this feature is planned later this year. Thanks for your interest! I would like to see the addition of the ability to share recipes. I just entered my first recipe for the purpose of texting it to a friend, but found I couldn’t. Then I discovered that I couldn’t copy it to paste into a text. those 2 features would be helpful. Hi Marsha, thank you for your feedback. Kindly note that it is possible to send Recipe via Email or SMS. Just go to More –> Recipe ingredients –> Choose a recipe you want to share in selector on top –> Menu –> Share –> Choose the application to send your recipe. My version doesn’t quite work like the screen shots here and its not adding quantities up correctly when adding the same ingredients from different recipes. Had the version changed? Hello, thanks for your feedback and your question. Yes, the screenshots reflect relatively recent changes in the app. So please make sure you have “Beta 16″ installed on your phone. Thanks and please let me know if you have any further questions. UPDATE: Please disregard the previous comment. It turns out that Beta 16 messed up the ability to add ingredients as described above. Sorry for inconvenience, this is going to be fixed in the very next update. Is there a way to enter all of my recipes (either from Allrecipes or out of word documents) without typing them manually into my phone? Hi Jen, thank you for your question. Unfortunately, for now, the only way to enter recipes is by typing them into a phone. We plan to introduce online editing along with Advanced Web UI feature planned later this year. It would be nice to have a “master list” of recipes (as I think this was intended) as well as a “weekly list” so I know what recipes I bought ingredients for. Right now, I am adding/deleting recipes weekly. That’s not allowing me to use the great features of adding ingredients to the list, etc. Thanks! Hi Mel, thank you for your feedback and suggestion. Kindly note that Meal planner feature is planned later this year. 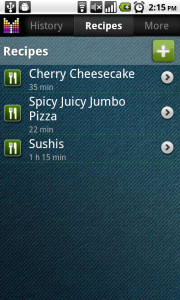 It will enable a convenient way to manage recipes and plan weekly meals. Thanks for the quick reply. I didn’t see that it was already planned (so much for feeling really smart, wink!). We think your program is great! Mel, thank you so much for your feedback. Don’t hesitate to contact us with any comments or questions.